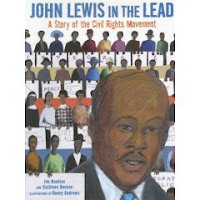 John Lewis In the Lead: A Story of the Civil Rights Movement by Jim Haskins and Kathleen Benson, illustrated by Benny Andrews. Copy donated by Lee & Low. Picture Book. The Plot: A nonfiction picture book about John Lewis, focusing on his involvement in the Civil Rights movement in the 1960s. John Lewis was born in 1940; this book traces Lewis's life as a child, through his adulthood, concentrating on his involvement in the Freedom Rides, SNCC, and the Selma to Montgomery March that ended in violence, as police and troopers attacked the marchers. The Good: I didn't know who John Lewis was before reading this book;* it gives a nice overview of Lewis, and I can easily see using this book for programs for Election Day, Martin Luther King Jr Day (Lewis worked with King), or Black History Month. Andrew's illustrations, which have a folk art look to them, illustrates some pretty violent episodes. Is this a children's book? Of course! This is part of our history; and Lewis's actions during this time are admirable. History cannot be hidden because it is violent or unfair or difficult; and Lewis proves a role model who acts, who tries to make the right choice, who is a leader despite his youth. It's one thing to say you are for nonviolence; it's another thing to keep to that view when personally attacked; when you see other assaulted and killed. To keep with those convictions, and triumph, demands respect. Kids need books like this. Lewis saw that "it was time to turn things upside down in order to set them right side up." It is powerful, and important, to read about someone who believed that; who acted; and who continues to act. Lewis's actions help bring about the Voting Rights Act of 1965; and over twenty years later, Lewis was elected to the House of Representatives. It's a post that he still holds. *Which shows that I have not yet read Freedom Riders by Ann Bausum. Lee & Low Page. (includes preview).